Kasmaal	Independent Somali news and analysis website . As Moon heads to Washington, Kim turns to old friend Moscow South Korean president to hold talks with Trump while North Korea looks for support in the region. Seoul, South Korea – South Korean President Moon Jae-in is stepping into his role as mediator again as he flies off to Washington for a meeting with United States President Donald Trump on Thursday. He is hoping to salvage what is left of the aborted Hanoi summit where the US and North Korea failed to reach an agreement at the second time of asking. But as Moon heads to the US, North Korea is looking to old friend Moscow, as Kim Jong Un seeks a way out from under the sanctions that are now overwhelming the country’s economy. The Trump-Moon meeting in Washington comes a few hours after Pyongyang hosts its 14th Supreme People’s Assembly, where many expect North Korea’s leadership to reveal its path with regards to its relations with the US. There are rumours that Kim will be meeting Russian President Vladimir Putin. Last month, a Kremlin spokesperson revealed that plans were under way for the event with the date and location to be decided. This comes almost a year after Moscow first extended the invitation to North Korea. Last month, Pyongyang’s chief of staff visited Moscow before heading to Vladivostok, a key port city on Russia’s east coast and a strategic trade post in Russia-Korea relations. With sanctions taking their toll on North Korea, Kim has also been pushed to seek support from its neighbour. According to Kim Jae-chun, professor of international relations at Sogang University in Seoul, North Korea is in “more economic trouble than was expected”. Last week, Daily NK reported multiple factory closures since the failed Hanoi summit put hundreds of North Koreans out of work. Pyongyang once again shelved plans for the grand opening of a massive beach resort on the country’s east coast. Analysts believe sanctions are making it difficult to import the necessary materials to finish the project. What’s next for US-North Korea ties after Hanoi summit failure? Putin’s offer of a meeting, which Kim may have put on hold as he gauged progress with the US, may suddenly have become more attractive. Last month, Russia delivered 2,200 tonnes of wheat to North Korea through the World Food Program to help curtail what the Russian Embassy in Pyongyang called “unfriendly interpretation of sanctions by some countries”. For Moscow, a meeting with Kim is a chance to grow its influence in East Asia and rejoin the peacemaking process on the peninsula, which it has been largely left out of in recent years, said Kim Hyuntaek, a professor of Russian Studies at Hankuk University of Foreign Studies. “They waited a long time. They’d like to make their voice heard,” said Hyuntaek. And as Russia joins China in calling for easing of the sanctions on Pyongyang, these voice may differ from those coming out of Washington. Moscow has also encouraged inter-Korean dialogue as the best way to resolve conflict on the peninsula, urging Seoul to make its own choices and “not just rely on its alliance with Washington”, said Hyuntaek. However, none of this is likely to help President Moon’s case as he, yet again, puts his reputation on the line to barter on North Korea’s behalf. With no developments, Moon will have to sell Trump the same step-by-step approach to denuclearisation or perhaps a watered-down version of what was apparently turned down in Hanoi. “Moon is thinking there’s going to be a middle ground,” said Kim Jae-chun of Sogang University. 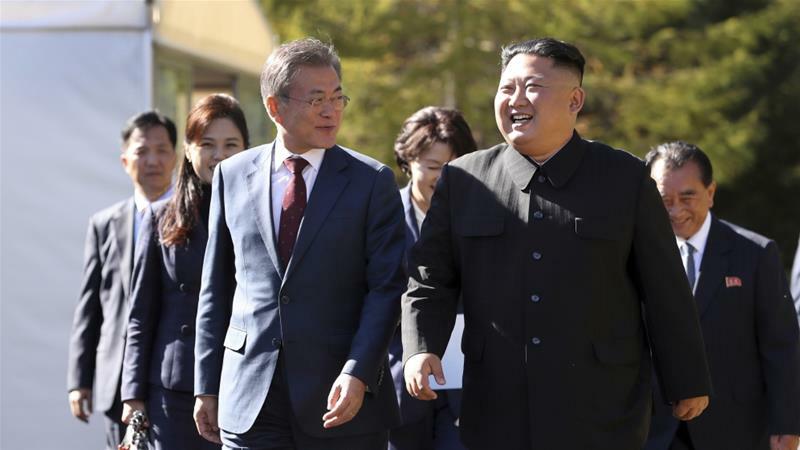 Only Moon’s inner circle knows the details of what is on offer in Washington and Kim Jae-chun suggested liaison offices in the US and North Korea could be one item of discussion. President Moon could also float the idea of formally ending the 1950-1953 Korean War, which has existed under a ceasefire. Reopening the Geumgang Mountain tourist site might also be on the agenda, said Jae-chun, since South Korean businesses also invested in its development. While the South Korean president knows the odds he faces in Washington after Trump made it clear in Hanoi that he was after a big deal, Moon’s job now is to persuade the US president to agree on a smaller step. Trump, meawhile, will be under pressure to hold firm by officials like his national security adviser John Bolton, who North Korea has blamed for the collapse of the Hanoi talks. They are odds Moon will have to go with. He only has a single five-year term to leverage his relationship with the North Korean leader. Moon has openly stated his hopes for Korean reunification. It was his herculean effort that saved diplomacy ahead of the Singapore summit, where Trump and Kim struck a bond, if not a deal. Repeating that success in Washington will be a tall order, but Moon is working on the belief that momentum is something neither side is willing to throw away. “Both countries have come too far to go back to the status quo,” said Kim Jae-chun. A generation lost’: The victims of Sri Lanka bombings Here are the stories of some of the 350 people who died in the Easter Sunday bomb attacks in Sri Lanka. Social media blocked for over 24 hrs in SL after bombing… Blocking social media platforms yield effective results?